This system uses an SA-02 and dedicated software to realize acoustic power level measurements either with the semi-anechoic or the reverberant method. Even if the generated noise energy is the same, machinery, electrical products, office equipment and similar will produce different ambient sound levels, due to a number of factors. When installing or removing equipment, measurement of acoustic power levels, i.e. acoustic energy produced per time unit, is necessary for predicting noise levels. The same applies when evaluating equipment on its own, with regard to its behavior as a sound source. 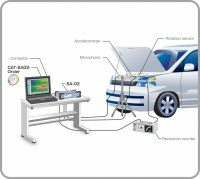 To measure the acoustic power level of a sound source, a measurement system consisting of measurement microphones and preamplifiers, a multi-channel signal analyzer SA-02 series unit, and acoustic power level measurement software is used. 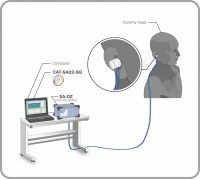 This system reads measurement data files recorded by the SA-02 and calculates sound quality and acoustic evaluation quantities (loudness, sharpness, roughness, etc.). By using the same hardware (SA-02 etc.) and only changing the software, various evaluation quantities can be calculated. 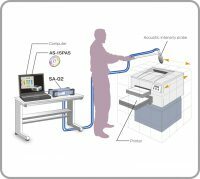 Visualization of a particular sound is possible by using an acoustic intensity measurement system or sound source location system. The acoustic intensity measurement system uses multiple measurement points arranged in a mesh pattern to accurately measure sonic intensity. When measurement for all measurement points has been completed, a contour diagram or similar is drawn to visualize the result. However, the contour diagram can only be created after measurement has been completed. The sound source localization system on the other hand graphically shows the arrival direction of sound in real time. This allows making a judgment already during the measurement. Use of the tracking analysis measurement system allows frequency analysis of rotational frequency or order. 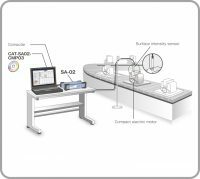 Use of the surface intensity comparator measurement system enables pass/fail evaluation based on sound even in an environment with a high background noise level such as a production line. 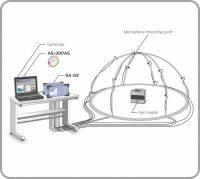 Using the acoustic intensity measurement system allows the creation of contour diagrams and other tools for visualization of a sound source.